Frank Massarella was drawn to pottery because he loves the feel of the clay and the independence of the work. 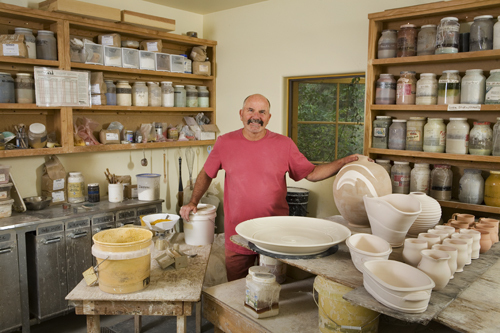 His state-of-the-art kilns provide him with more versatile ways to fire ceramics. He sees ceramics as a dichotomy, simple yet complicated. Correlating design with a three dimensional form is a lifelong endeavor. Frank experi-ments with glazes, exploring how to apply them to form. Experience makes him have greater expectations about the pieces he produces. Simultaneously, he becomes more sophisticated in the surface enrichment of his ceramics. He is known for both utilitarian pieces and more sculptural, free forms that turn traditional ceramics into expressionist and abstract art. Frank Massarella’s documentation took place in 2005 and was sponsored by the Jessica and Stanley Prescott Trust. The FOTM Archive contains extensive information about this artist.